In just over two years being open on Alberta Avenue, we’ve worked with so many incredible female artists here at Bleeding Heart Art Space. Today we celebrate International Women’s Day by highlighting the work of nine of the wonderful, creative, world-changing women we’ve worked with right here in Edmonton. Where else could this list start than with the powerhouse indigenous artist who is Lana Whiskeyjack? This time last year, Lana’s solo show kâ-katawasisicik iskwêwak shone vivid light on Women Who are Beautiful, while, across the street, our installation of red dresses ( Ni Wapataenan / We See ) called attention to the hundreds and hundreds of missing and murdered Indigenous women in this country. I write this as Hilary Mussell’s WILD FOLK look on. 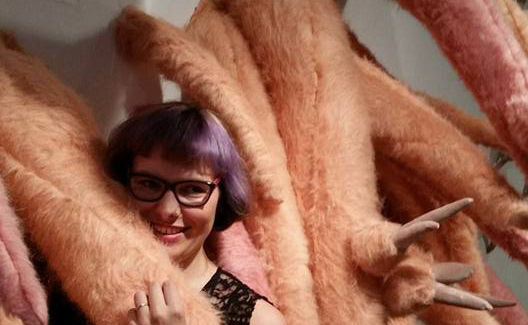 Her installation inhabits the Bleeding Heart through this Saturday, March 11. 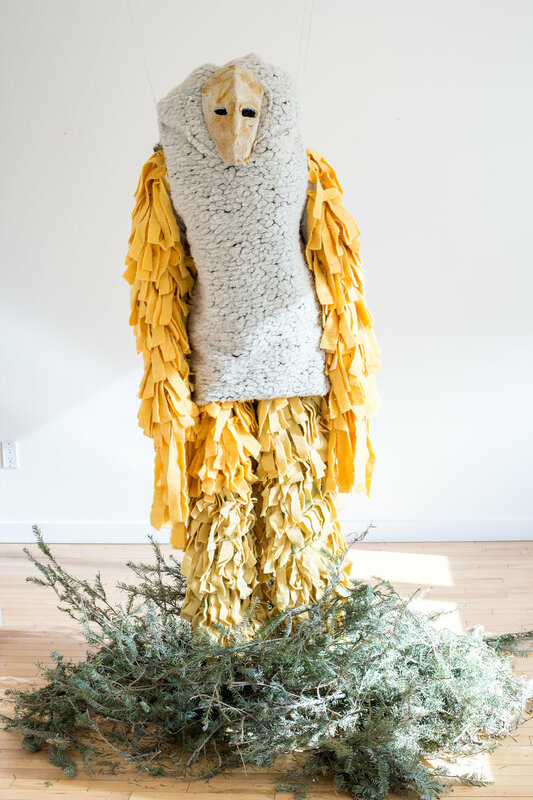 Hilary is incredibly creative and resourceful, turning scraps of fabric and recycled elements into otherworldly creatures begging for their histories to be imagined. Mussell’s work contains a beauty and strangeness that calls into question our ideas of identity. Her sculptures evoke reactions from unsettling fear to unrestrained laughter, depending on the viewer. It’s interesting to look at her WILD FOLK and wonder who they might be, and why we make those assumptions. Mussell’s video work in the piece brings movement into the identity puzzle as well, asking how we relate to our bodies, and how our physical form informs our personhood. Hilary Mussell lives in the McCauley neighbourhood, not far from the gallery. We’re happy to have such a wonderful neighbour. Visit Hilary Mussell online at hilarymussell.com, where you’ll find so much more than a few WILD FOLK. See WILD FOLK at the gallery this week on Wed-Friday from 1-3 and Saturday from 11-3. Pam Baergen is an Edmonton artist working with found photographs to create, among other works, storied ‘shadowbox inks’, beautiful in their layered complexity. Baergen also happens to be our brand new Artistic Director, so you’ll be hearing more from her in the very near future. image from Pam Baergen's website. While Baergen hasn’t had a solo show at Bleeding Heart, she’s participated in our selection jury and contributed to our ArtLucks regularly, as well as showing work in our first OPEN WALLS exhibit. Wenda Salomons is a photographer who makes the most of the world she encounters. Her unique framing and photographic techniques capture what I like to call the ‘Sacred Small’–the oft-unnoticed beauty of our everyday world. Salomons has exhibited her pinhole photographs in solo gallery exhibitions, and currently shares her smartphone window-to-the-world through her Instagram account, woowoowenda . Last year, a series of her Instagram images were printed and installed for our Thresholds poetry event. Like her photographs, there is always plenty going on beneath the surface for Salomons. Hear my conversation with Wenda on the imperfections of image-making here . Carly Greene is young woman navigating the world of contemporary art guided by cardboard and compassion. Her show Built to Last was installed in our gallery this winter, challenging our ideas of memory, its permanence and its reliability. Greene draws on experiences with seniors she works with , many of whom long for a blurring sense of a home to which they cannot return. I mention compassion here because Greene’s own ‘bleeding heart’ is palpable as she discusses her work and the questions it draws us into. We were blessed to hear here speak at three separate events throughout the run of Built to Last. Greene’s beautiful prints from this show are still available in our Drawer Store . Bernice Caligiuri is a purple-haired neighbourhood treasure, capturing nearly every significant moment, and many not-so-significant moments, with her point-and-shoot camera (you can find several of her albums on permanent display here in our gallery microLibrary). Photography is just the tip of the massive iceberg that is Caligiuri’s lifelong art practice. Last spring 150 works from seventy year old Caligiuri filled our walls. There were dozens of paintings, sculptures, fibre works and three-dimensional dioramas of her family farm and more fanciful locations. Bernice is a woman who has come into her own in these later years of life. After the death of her husband several years ago, Caligiuri found welcome in the Alberta Avenue community, and discovered a creative energy she had kept at bay for decades. Among the many gifts Caligiuri, a regular volunteer here at the gallery, has given us is this collage-meets-painting of Bleeding Heart Art Space, featuring many familiar faces. It hangs in my office over at St.Faith’s Anglican Church–a daily reminder of just what we’re up to here at Bleeding Heart. Bernice Caligiuri also writes a very funny limerick. Remember when Bleeding Heart Art Space became a rushing river every night for more than a month? Alysha Creighton did that. Creighton has moved out west now, but I still encounter her influence here at the gallery in young women who were taught by Alysha Creighton or inspired by her installation works. Creighton has also worked as a Lead Artist at the Nina Haggerty Centre for the Arts. Creighton’s video work was part of the Art Gallery of Alberta’s 2013 Biennial and her installations throughout the city are too numerous to list here. Marcie Rohr continues to draw those around her into the beautiful mess of community, both in her paintings, her participation in our ArtLuck events (the name comes from Rohr) and her recent Ceremony for Common Ground. Beautiful mess may be the perfect term for Rohr, as she works days (and nights) as a nurse on the maternity ward. Marcie Rohr continues to inspire me as a woman making the world a better place with equal parts power, compassion and vulnerability. As we close our our list, shall we travel to the future? How about June? Runyan is an excellent poet in her own right, and her poems often deal with what it means to to be a woman within male-dominated religious culture. In Second Sky , Runyan reads the writings of the Apostle Paul through the lens of a suburban woman trying to manage the brokenness of her world. A Thousand Vessels is filled with poems that bring our contemporary world face to face with the lived experience of ten women from the Bible. Read two of Runyan’s poems online at the Harvard Divinity Bulletin . Celebrate women in the arts who inspire you by sharing their work in the comments below!